Notes for triangles chapter of class 10 Mathematics. Dronstudy provides free comprehensive chapterwise class 10 Mathematics notes with proper images & diagram. (1) Similar Figures : Two figures having the same shapes (and not necessarily the same size) are called similar figures. For Example: The given below squares are similar. (2) Congruent Figures : The word ‘congruent’ means equal in all aspects or the figures whose shapes and sizes are same. For Example: The given below squares are congruent. (3) Two polygons of the same number of sides are similar, if (i) their corresponding angles are equal and (ii) their corresponding sides are in the same ratio (or proportion). For Example: The given below quadrilaterals ABCD and PQRS are similar. (4) Two triangles are similar, if (i) their corresponding angles are equal and (ii) their corresponding sides are in the same ratio (or proportion). For Example: The given below triangles ABC and DEF are similar. (5) Theorem: If a line is drawn parallel to one side of a triangle to intersect the other two sides in distinct points, the other two sides are divided in the same ratio. Firstly, join BE and CD and then draw DM ⊥ AC and EN ⊥ AB. Now, area of Δ ADE = 1/2 × base × height = 1/2 AD × EN. So, ar(ADE) = 1/2 AD × EN, ar(BDE) = 1/2 DB × EN, ar(ADE) = 1/2 AE × DM, ar(DEC) = 1 2 EC × DM. From (1), (2) and (3), we get, AD/DB = AE/EC. (6) Theorem: If a line divides any two sides of a triangle in the same ratio, then the line is parallel to the third side. Proof: Given, DE || BC. Now, AD/DB = AE/EC (Theorem 6.1) or, DB/AD = EC/AE. (7) Criteria for Similarity of Triangles : For triangles, if the sides and angles of one triangle are equal to the corresponding sides and angles of the other triangle then they are said to be congruent triangles. The symbol ‘~’ stands for ‘is similar to’ and the symbol ‘≅’ stands for ‘is congruent to’. For Example: Consider two ∆ ABC and ∆ PQR as shown below: Here, ∆ ABC is congruent to ∆ PQR which is denoted as ∆ ABC ≅ ∆ PQR. ∆ ABC ≅ ∆ PQR means sides AB = PQ, BC = QR, CA = RP; the ∠ A = ∠ P, ∠ B = ∠ Q, ∠ C = ∠ R and vertices A corresponds to P, B corresponds to Q and C corresponds to R.
(8) Theorem: If in two triangles, corresponding angles are equal, then their corresponding sides are in the same ratio (or proportion) and hence the two triangles are similar. 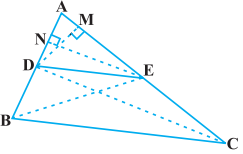 This criterion is referred to as the AAA (Angle–Angle–Angle) criterion of similarity of two triangles. 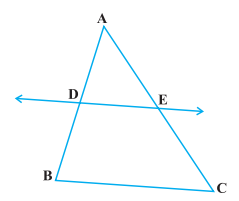 Given: Two triangles ABC and DEF exists such that ∠ A = ∠ D, ∠ B = ∠ E and ∠ C = ∠ F. To Proove: AB/DE = BC/EF = AC/DF. Proof: For the triangle DEF, we mark point P such that DP = AB and mark point Q such that DQ = AC. And join PQ. Hence, Δ ABC ≅ Δ DPQ. Therefore, ∠ B = ∠ P = ∠ E and PQ || EF. Hence, AB/DE = BC/EF = AC/DF. (9) Theorem: If in two triangles, sides of one triangle are proportional to (i.e., in the same ratio of) the sides of the other triangle, then their corresponding angles are equal and hence the two triangles are similar. This criterion is referred to as the SSS (Side–Side–Side) similarity criterion for two triangles. 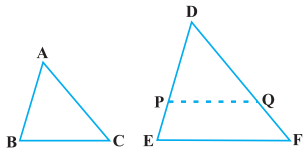 Given: Two triangles ABC and DEF exists such that AB/DE = BC/EF = CA/FD (< 1). To Proove: ∠ A = ∠ D, ∠ B = ∠ E and ∠ C = ∠ F.
For the triangle DEF, we mark point P such that DP = AB and mark point Q such that DQ = AC. And join PQ. As per the theorem, we can say that, DP/PE = DQ/QF and PQ || EF. Hence, ∠ P = ∠ E and ∠ Q = ∠ F.
Also, DP/DE = DQ/DF = PQ/EF. On comparison, we get, BC = PQ. Thus, Δ ABC ≅ Δ DPQ. Hence, So, ∠ A = ∠ D, ∠ B = ∠ E and ∠ C = ∠ F.
(10) Theorem: If one angle of a triangle is equal to one angle of the other triangle and the sides including these angles are proportional, then the two triangles are similar. This criterion is referred to as the SAS (Side–Angle–Side) similarity criterion for two triangles. Now, PQ || EF and Δ ABC ≅ Δ DPQ. Hence, ∠ A = ∠ D, ∠ B = ∠ P and ∠ C = ∠ Q. Therefore, Δ ABC ~ Δ DEF. (11) Theorem: The ratio of the areas of two similar triangles is equal to the square of the ratio of their corresponding sides. For Example:Two triangles ABC and PQR exists such that Δ ABC ~ Δ PQR. To Proove: ar(ABC)/ar(PQR) = (AB/PQ)2 = (BC/QR)2 = (CA/RP)2. Proof: Firstly, we draw altitudes AM and PN of the triangles. ⇒So, Δ ABM ~ Δ PQN (As per AA similarity criterion). ⇒ar(ABC)/ar(PQR) = (AB/PQ)2 = (BC/QR)2 = (CA/RP)2. (12) Theorem: If a perpendicular is drawn from the vertex of the right angle of a right triangle to the hypotenuse then triangles on both sides of the perpendicular are similar to the whole triangle and to each other. (13) Theorem: In a right triangle, the square of the hypotenuse is equal to the sum of the squares of the other two sides. For Example: A right triangle ABC right angled at B. To Proove: AC2 = AB2 + BC2. Proof: We draw BD ⊥ AC. As per previous theorem, we can write, Δ ADB ~ Δ ABC. Similarly, as per previous theorem, we can write, Δ BDC ~ Δ ABC. ⇒AC2 = AB2 + BC2. (14) Theorem: In a triangle, if square of one side is equal to the sum of the squares of the other two sides, then the angle opposite the first side is a right angle. Given: A triangle ABC in which AC2 = AB2 + BC2. To Proove: ∠ B = 90°. Now, for Δ ABC and Δ PQR, AB = PQ, BC = QR, AC =PR. Hence, ∠ B = ∠ Q (CPCT). But ∠ Q = 90° (as per construction). ⇒So, ∠ B = 90°.